📅 July 2017 March 4, 2019 by Bruno B.
It’s 2018 so time to sort this drama once and for all. Is Naples safe for tourists or not? Let’s spill the truth! It’s the elephant in the room of every discussion around Naples. Just like happened when I visited Rio de Janeiro, most of my conversations before heading to Italy’s third largest city had to do with safety. Naples stands out as the crazy chaotic brother of all cities in Italy. A huge contrast to Milan‘s elegance or Rome‘s classic beauty, the maze of crumbling narrow streets can be daunting at first. I confess I started questioning my safety when reading online some reviews and posts. So is it really like this? Should you be paranoid? How much of this is true and how much is being dramatic? I’ll try to put it clear as water. Is this where they throw bombs at each other? 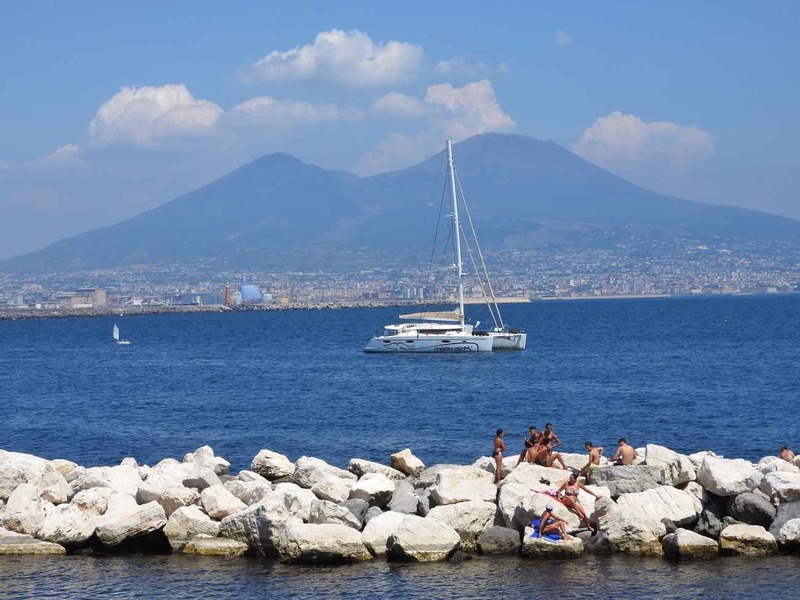 Safety facts about Naples, Italy: What is really true? How safe is Naples compared to other cities? To start, nothing better than putting things in perspective. 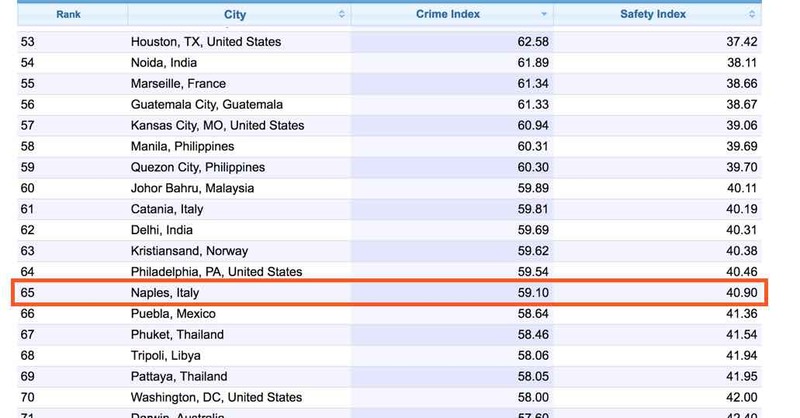 If you look at the Criminality Index in Numbeo, Naples ranks #66 on the world. Surely not an amazing result, but this means Naples, Italy is safer than Houston, Philadelphia, Atlanta or 11 other US cities..
By the way, the unsafest city I’ve been is Rio de Janeiro, in #12. Also survived my trip there with no crime to report. In fact, Italian sources state that crime in Naples is less frequent than in Rome or Milan. What about that?! Let’s see what the US State Department’s report has to say. Visitors are generally safe and are not singled out/targeted based on nationality. 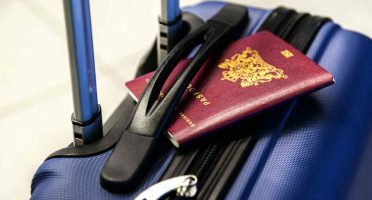 However, tourists and foreigners may be targeted for petty theft. Naples has long suffered a reputation as a dangerous place. In reality, the city today is a relatively safe place, especially if you heed the following basic safety tips. So… that’s it? No violent crime or risk of being murdered? No homemade bombs thrown at me? I can actually get out of Naples ALIVE? Yap. 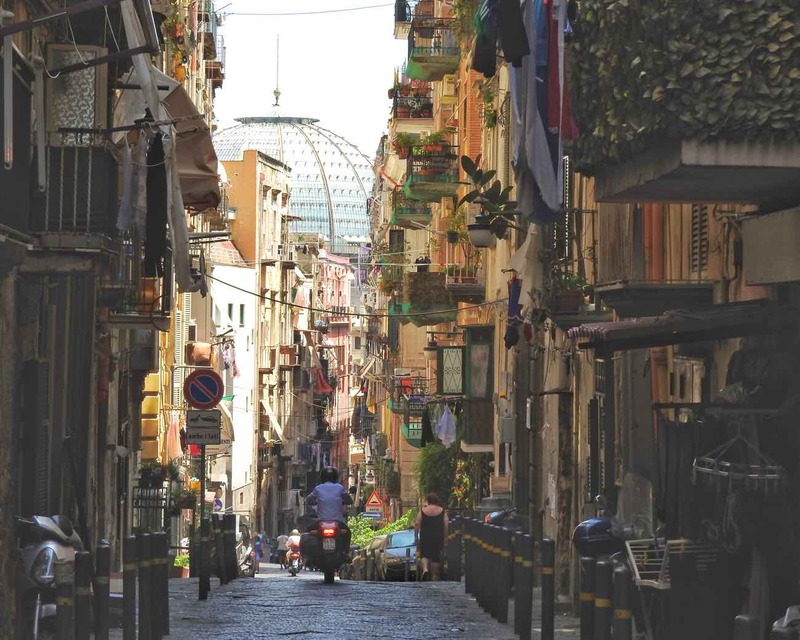 Like in any big city in Europe, pickpocketing, bag snatching and fraud at street markets can occur in Naples. It’s mostly small crime of convenience which can be relatively safeguarded with some basic safety rules. As for violent crime, is extremely rare amongst tourists. But what about the Mafia? As shocking as is to believe that Mafia still operates in Europe, it does. For the past 400 years, the secretive and mysterious Camorra is deeply related to Naples’s black economy as well as honest businesses. Even its most famous pizzeria was blackmailed by Camorra at some point. Now as a tourist, what do you have to do this? Probably nothing. It’s extremely unlikely that you’ll be targeted by a Mafia thug. Their focus is on business owners and locals, they simply don’t care about yet another tourist coming to their city. Via Caracciolo, a completely safe area in Naples. 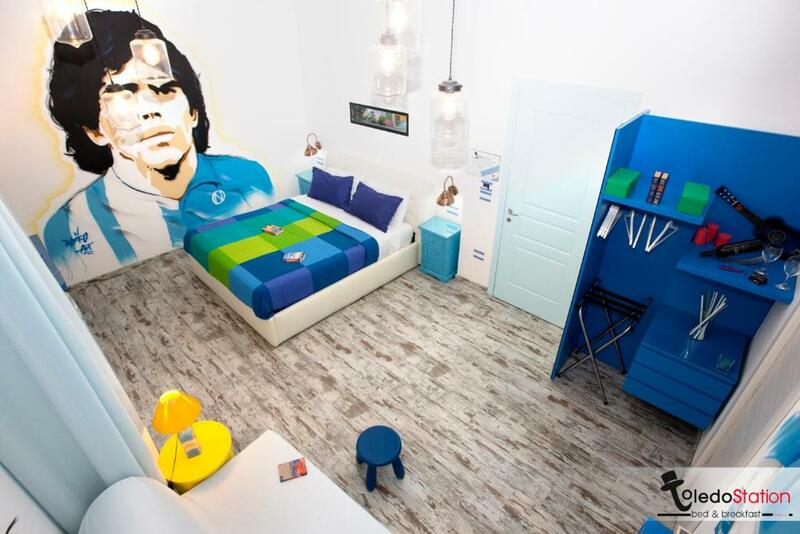 To be entirely fair, Naples looks and feels disorganized and it has indeed some dodgy and even ugly areas. The streets near the Central Station Garibaldi are an example. But how’s that different than any other city like New York or Paris? Even Rome has a dodgy area near Termini Station too and doesn’t suffer from this terrible travel reputation. And what about the absolutely safe areas no one mentions about? From what I’ve experienced Caracciolo, Lungomare and other zones in Centro Storico were absolutely fine to walk around. Or just use this shortlist of the best-reviewed hotels in Naples (9+), with WiFi and in the best areas of the city. Oh the infamous italian scooters and vespas. Yes, traffic can be chaotic, noisy and confusing. 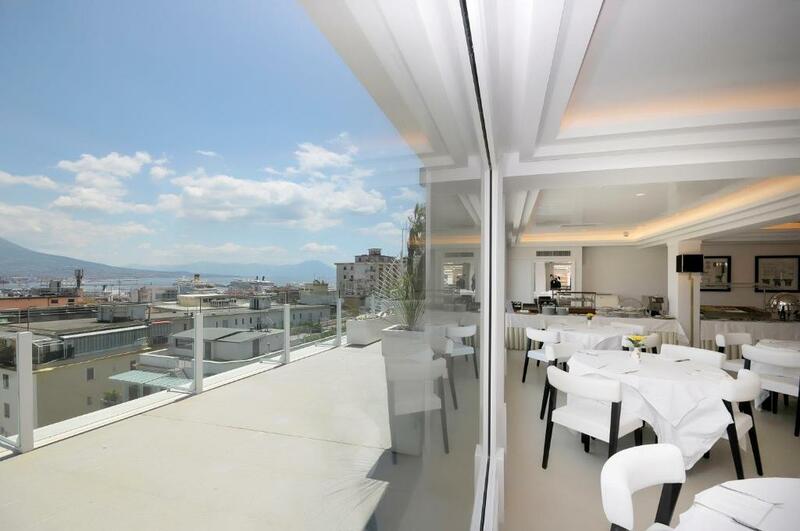 In this particular topic and in a much smaller scale, Naples is the Bangkok of Europe. Seeing 3/4 people on a scooter is not uncommon. Quite frankly, walking through the narrow, poorly-maintained and crowded streets of the city center while motorcycles race around might be riskier than crime or petty theft. I completely understand this uncivilized driving behaviour can be shocking for some. However if you’re an experienced traveler and have visited places like India, Thailand or Vietnam before, Naples shouldn’t shock you. If you want to maximize your chances of staying safe, follow the tips below. Note the majority of them are standard safety rules to follow ANYWHERE! 1. Don’t go there paranoid. This might be the most useful piece of advice. Don’t get scared by the online reviews of Naples. 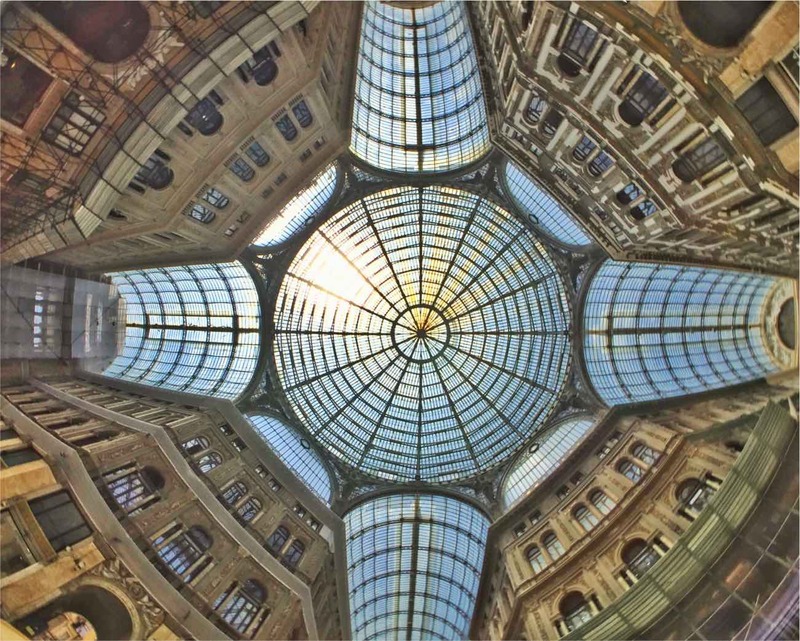 The first step for your Naples trip is to take reviews from TripAdvisor and similar websites with a pinch of salt. Online reviews are a topic for a post alone. But in a nutshell just because it’s online doesn’t mean it’s the general rule. To start, you don’t know who’s writing them. People who heard a story from someone who heard a story from someone who heard a story? Have they even been to Naples? Even if they have been, there many travel personas and chances are they don’t see places the way you do. If someone that has only traveled in luxury cruises lands in Naples, of course he’s only going to regurgitate what he knows about its reputation. Expect a dissertation on “Oh it’s so unsafe and ugly”. Most likely he will struggle and/or refuse to see past the graffiti (Italian word for a reason) and a couple of dirty streets. When you are faced with these comments, challenge back. Ask why exactly they say is unsafe. Dig deeper. Perspective is key in the online world. Like any major city, there are areas you should avoid. 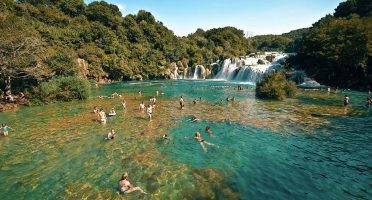 The cheapest hotels are concentrated around the Garibaldi Central Station, but staying there will give you a wrong idea of the city. The Quartieri Spagnoli (Spanish Quartier) zone can also be unsafe at night time. Only go there during the day – maybe to have lunch at the lovely Trattoria Da Nennella! The lovely streets of Spanish Quartier. 3. Don’t show off shiny jewelry or expensive gadgets. This one is obvious. You shouldn’t even do this on your home town. 4. Take care of your belongings. Another obvious one. Never leave your bags unattended. In restaurants and bars, loop your bag’s strap around your leg or arm. Avoid keeping valuables in easy-to-reach pockets – a money belt might be useful if you’re too concerned. 5. Take extra measures on the Circumvesuviana. The Circumvesuviana train seems to be the root of many issues affecting tourists in Naples. If you want to be extra safe, take the Campania Express train instead. Campania Express feels like a premium experience. For an extra fee, you can get to places like Pompeii, Vesuvius and Sorrento quicker. It’s a premium express train that only stops on the touristy places. Locals don’t tend to use it. If you still want to board the Circumvesuviana, at least board it in Porta Nolana instead of Garibaldi train station. 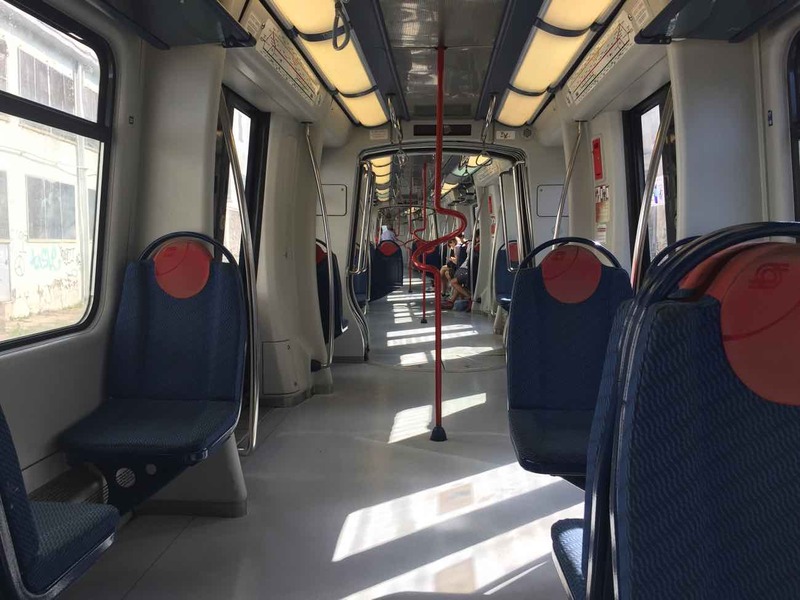 It’s less crowded, so it will guarantee you a seat. Not only this is more convenient, it’s an additional protection to potential pickpockets who normally target people next to the door. Some of the streets in Naples‘ city center are narrow and badly lit at night. Be careful with the vespas racing by. Many people overlook this. If you are entering a problematic zone already afraid, it will show. It will show on your body language, the way you walk, on your eyes. Keep a positive attitude and walk with a purpose. In my case, I also recur to my “not amused” face. If you walk around with a t-shirt “I ❤️ NAPLES”, you’re not putting yourself in a good position. I mean, this is not a theme park. 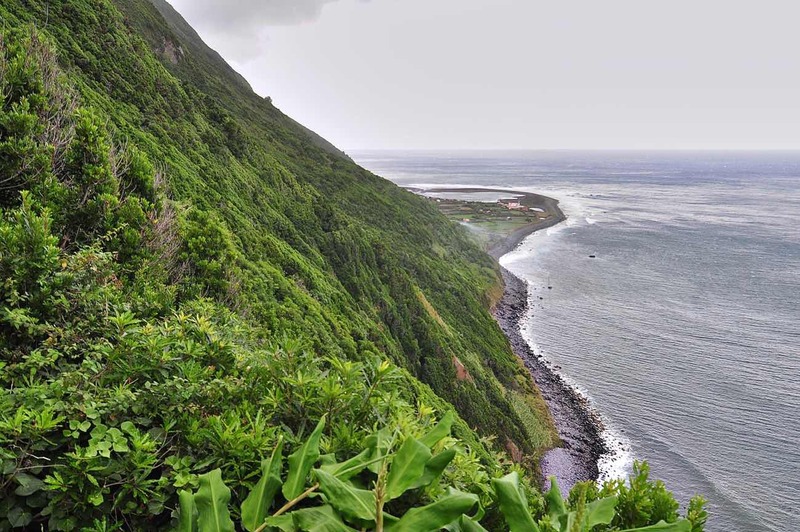 Watch how locals behave and dress themselves and try to blend in as much as possible. This should be one of the most exciting aspects of travel anyway! 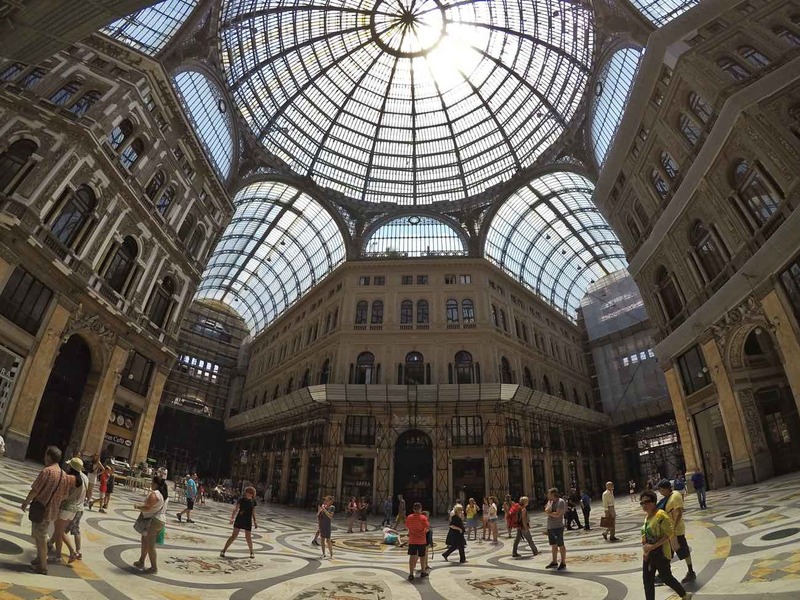 Quick answer to the title of this post is yes, Naples is safe for tourists. You just need common sense and to take the same precautions you’d take in other big cities. Maybe add an extra level of awareness in some areas like the Garibaldi Central Station. That’s it. Here’s a graph that scientifically put things in perspective. 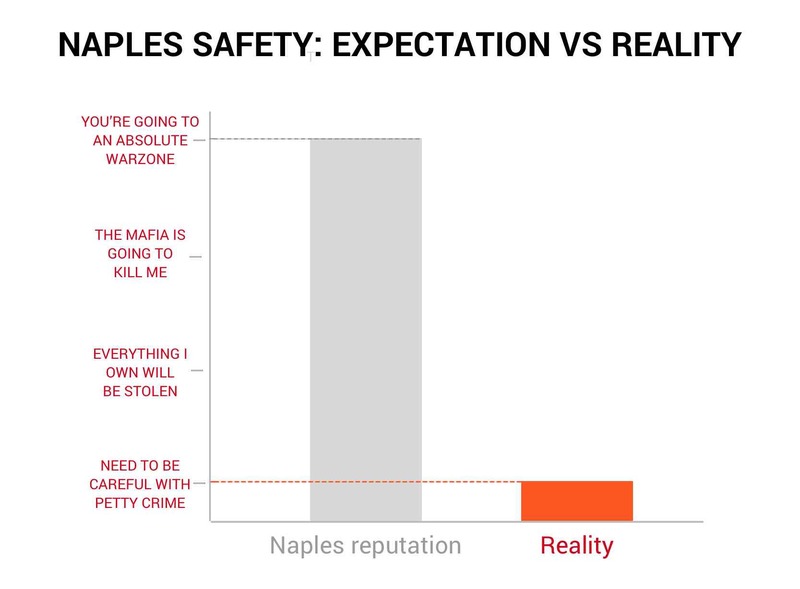 Safety levels in Naples: Expectation vs Reality. Not gonna lie. Naples is far from being perfect. Yes, it has some dodgy and dirty areas. Yes, pickpocketing targeting careless tourists can be frequent. Yes, you’ll need to be aware of your stuff. If you only travel to sterile and spotless places like cruise ships, Naples definitely isn’t your place. But for the average traveler, is there any reason to avoid Naples completely? Which big city in the world doesn’t have these issues? Why do people travel to India or Vietnam then, they surely aren’t 100% clean and safe places, are they? IMHO the danger for tourists is massively overstated and the city has things to keep you busy for at least a full day. It’s lively, authentic and has some of the best value in food in Western Europe. And the world’s best pizza (!) which personally is a big bonus for me. Don’t be paranoid with safety, try to look past the crumbling buildings or traffic jams and most of all: keep a positive attitude. Just like when I worried about visiting Rio de Janeiro, I realized fear is always your number 1 enemy. Did you feel Naples was safe? Did it lived to its reputation? Did you take any extra safety measures? Share your experience below!